© 2007 Jean Brandau licensed to About.com, Inc. 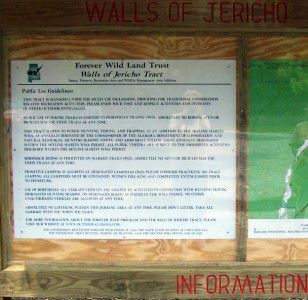 The Walls of Jericho is made up of 21,453 acres straddling the Tennessee-Alabama border used for preservation as a wilderness and recreation area. The Ranger informed us that the hike down and back would take close to six hours. Shortly after the Walls of Jericho Tract was re-opened to the public, my sister and I found ourselves in the vicinity and decided to check it out, take a few pictures and "stroll" down the trail. The Walls of Jericho is made up of 21,453 acres straddling the Tennessee-Alabama border used for preservation as a wilderness and recreation area. The Walls of Jericho has hiking trails and horse trails. Both lead into the gorge. A tent-only camping area is available at the bottom. It was a beautiful day and the trail looked clear and smooth. It didn't take us long, though, to realize we were out of our element. The Ranger informed us that the hike down and back would take close to six hours! Mike Dalen gave me this advice about the Walls of Jericho Hike: "It is a long hike but if you are in decent condition and take it slow you can make it. Total distance is about 7 miles round trip. But it is no mall walk. It would be like starting on top of Monte Sano and hiking to the bottom. Then hike 3 or 4 miles on relatively flat but rocky trails. And finally, hike back up to the top of Monte Sano. You should allow 5-6 hours for the hike, wear hiking shoes, and bring 2 or 3 liters of water per person. And some snacks for fuel. This hike is for experienced hikers in great shape....you won't see me in any of these photos! The Walls of Jericho were named for a bowl-shaped canyon of rock that shoots water out of holes and cracks in the rock wall during heavy rains. It is part of a 60,000 acre tract once owned by Texas oil baron Henry Lee Carter. When he died in 1977, the Walls of Jericho were sold and closed to visitors. The Walls of Jericho includes the headwaters of the Paint Rock River, which is home to 17 varieties of rare mussels. Two of them are found nowhere else but the Paint Rock River watershed. This cave at Walls of Jericho that is only accessible when the water level is down. This breathtaking view is your reward for making the long hike down to The Walls of Jericho.